When I select our chapter book read-alouds for the year, I typically reference several different lists of literature to find some of the best titles recommended for a particular age group. I’ve very rarely found myself in the position of feeling like I had made a potentially questionable choice as far as the appropriateness of a book for my kids. I picked up a copy of Cheaper by the Dozen by Frank B. Gilbreth and Ernestine Gilbreth Carey at one of the many book sales I’ve attended in recent years — I think I vaguely recalled having seen it on one of my book lists…then seeing it on my shelf when I was making my list to read-aloud to Miss M, I added it since we already had a copy. Overall, I guess it was an okay choice to read — Miss M thought it was really funny (as did I). But if I would have known a bit more about the content of the book, I think I would have saved it for when Miss M was just a bit older. Cheaper by the Dozen is a biographical tale about the family of famous efficiency experts Frank and Lillian Gilbreth. Mr. Gilbreth has many useful ideas for improving efficiency in factories and other workplaces, and he tries to incorporate some of those ideas at home…with predictably funny results. Of course, life in general with a family of 12 kids is bound to be funny! The book takes place in the early 20th century, and some of the antics of the Gilbreth family seem especially funny now, considering “modern” sensibilities — like tonsils removed assembly line style at home, and the whole troop of children piled seemingly one on top of another in the back of the family car with two crying babies on mom’s lap. The chapters of the book are somewhat thematic, while there is also a bit of time progression as the book continues on — stories of first dates and learning to drive are found more toward the end of the book. Speaking of those first dates…this gets into a few things I found “questionable” about the content of this book — at least when considering at as read aloud for an 8.5 year old. As the girls of the family get to be teenagers, there is discussion about what they might be doing with their boyfriends. Nothing graphic of course…but I really don’t need to be explaining “necking and petting” to my 3rd grader. There’s also a “peeping Tom” who wants to watch one of the girls through the window as she puts on her pajamas, and a lady on a birth control crusade who is sent to the Gilbreth home as a joke by a friend who has a large brood of children herself. Not awful topics to be discussing with my daughter…but definitely different than the topics our read-alouds usually bring up. Members of the family take the Lord’s name in vain regularly — luckily this is pretty easy to edit out, though I forgot a few times and saw a pretty surprised look on Miss M’s face (since that’s not something that would be acceptable in our home)! After we finished the book I started to wonder whether I imagined ever having seen Cheaper by the Dozen on a list of recommended reading for elementary age students. A little bit of research revealed that this title used to be included on Sonlight’s Core E list (for approximately 4th grade), but was discontinued from their curriculum. Too many complaints about the content, perhaps?!? 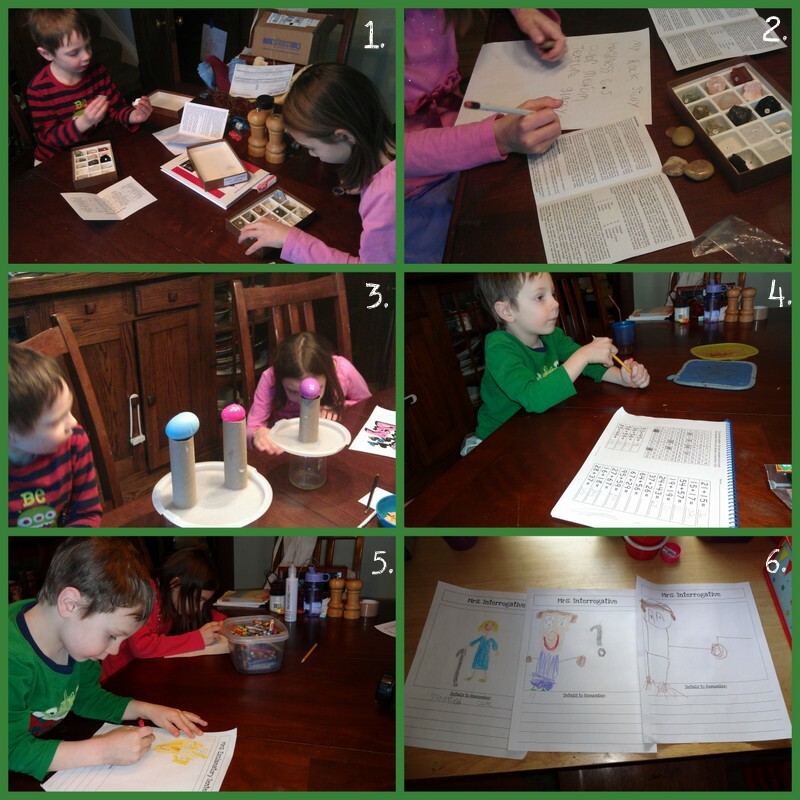 It’s been about a year since my last “day in the life” sort of post, and I never got a “daily schedule” post written last fall, so I thought I might share a bit about what a “typical” homeschool day is looking like for us at the moment. For anyone just joining us, I have a 3rd grader (Miss M) and a Kindergartener (Mr. E) this year, plus a preschooler (Mr K turns 4 in early February), and an older baby/young toddler (Baby J is about 15 months…but not walking yet, so not exactly a toddler per say). I started out the school year last September thinking we might try a timed schedule (I think I’ve said that every year, actually! ), and having short subject blocks of 15-20 minutes for everyone. There are some merits to that sort of schedule, but I think I have finally learned once and for all at least for the near future that running our school day with any sort of firm time schedule to switch from subject to subject just produces an excess of stress. Early in the school year we fell into a routine that has served us fairly well. Everyone is usually up around 7 or maybe 7:30am. I try to get up between 6 and 6:30am…but we all know how that goes. Some days I’m the one sleeping in if everyone else is too! The idea is that breakfast, getting dressed, and otherwise getting ready to face the day should be done by 8:30am (or maybe 9am at the latest!). We’ve been pretty good about all making that one this year! Sometime before that 8:30am mark, I write out Miss M’s independent work for the day in her daily planner. Back in August, I asked her if she preferred a checklist, chart or planner this year for her independent work. She selected a basic student planner from Target. Each day’s work for Miss M starts out with Bible reading, daily calendar notebook, and something for history — either her choice from our book basket or an assigned historical fiction selection. Miss M likes to “cross it off” on the list, so I write down even the items that are the same each day. Beyond these items, Miss M’s independent work often involves math practice worksheets, spelling or math practice on the iPad and reading or notebooking for science. By 8:30 am (on an ideal day anyway) Miss M has consulted her list and started in on her independent work for the day. Some days Mr. E and Mr. K and I are ready to start on their daily agenda at this point as well. Other days, they are already in the middle of Legos, blocks or some imaginary game involving anything from super heroes to angry birds. If they are in the middle of something, I let them play. I often let them know that I will set a timer for them for 15 minutes or half an hour and that’s when “school starts” for them for the day — it’s really more for Mr. E’s benefit since most of the “school work” that needs to happen is for him, rather than for his younger brother. I used to start Mr. E’s Kindergarten time with his reading practice. Since the beginning of the new year, we’ve made a commitment to have everyone listening to or reading the Bible in the family. Mr. K sometimes (or maybe even often) wanders away, but Mr. E really enjoys listening to a couple chapters everyday of the YouVersion app’s NLT audio Bible. Then comes reading practice for 10 or 15 minutes, followed often by me reading aloud to the boys from books they select. Mr. E may take a short break at this point (especially if we’ve done his reading practice and story time). I have to hope he doesn’t get TOO involved in anything else during the break time — but sometimes he does and a 10 minute break extends to 30 minutes or an hour! We typically tackle math next — Mr. E’s favorite subject. Lately this is looking like anywhere from 10-20 minutes doing RightStart B, plus about 10 minutes or so to read a chapter of Life of Fred. Mr. K sometimes sits and listens in on Mr. E’s math, but more often than not he goes off to play in the boys’ room. By this time (unless math was preceded by a long break), Mr. E is definitely ready for a snack and longer break. Meanwhile, on a good day, Miss M may be close to finishing up her independent work by this point! If so, it’s an easy choice to suggest a short break and a snack for her, and then move into doing her “together” work with me — this sometimes involves spelling and usually involves math. If she’s not quite done with her independent work, she may leave it to finish later (usually not her preference), or continue working until it’s done and have a short break and snack later. If everyone is ready for snack at the same time, I try to read aloud to all the kids. This may be a fiction or non-fiction selection for history, The Sentence Family (a story-based grammar program we started recently), or just another family read-aloud. When Miss M is ready, we work together. Baby J used to almost always be ready to take a nap by this point…I miss those days! Now that he is an almost-toddler, he rarely is ready for a nap in the morning (maybe by 11am if he is extra tired). Especially while I am working with Miss M, I try to either distract J with a favorite toy, or convince the other two boys to please play with their brother (instead of playing Legos which distinctly leaves the baby out!). The boys are most often playing while I work with Miss M — but I am not above keeping them out of our hair by letting them play an educational game on the iPad every now and then! After I’m finished with Miss M’s math, spelling and anything else she needs help with, my next effort is often to consider if it’s time to start lunch — I might need to get something started in the kitchen. Sometimes I take a break and for a few minutes too! Then (assuming it’s not already too close to lunch time…on a good day, we usually still have a bit of time until everyone will be super hungry) I attempt to coral the boys for their Logic of English Foundations lessons. This is something new we’ve added since Christmas. Now it’s time for lunch. If I haven’t made lunch yet, the kids play for a bit while I take care of that. I’m trying to get in the habit of reading to the kids during lunch time — usually from a history read-aloud. If we didn’t get any reading aloud done during lunch, we will try and do some reading shortly after lunch. “Official” school work is usually done at this point! Yeah! Afternoons: Free time, fun, chores, and ??? Let’s face it…Mom needs a bit of break too after a morning of focusing with the kids on school. I have never figured out how to develop that clever “quiet time” habit some moms have of sending the kids to play quietly in their rooms for a certain amount of time. Instead, I encourage the kids to pursue their interests and hobbies many afternoons. For the boys this may mean playing more legos, drawing, pretending, or playing outside. Miss M often reads or does a craft project of some sort. I try to grab a few minutes to relax, and then spend some time doing chores or cooking (often with Baby J following me around and playing near me, if he isn’t playing with his brothers!). Miss M often has chores assigned to her as well that she needs to complete sometime in the afternoon. Of course, some afternoons I have a project in mind for the kids — whether it be arts and crafts, cooking, or maybe even a longer science activity. And some afternoons we snuggle up on the couch and read together. Usually about two days a week we are going somewhere in the afternoon — typically one day for an extra-curriculuar activity, and the other day for errands of some kind (library, Target, grocery store, etc). That shapes our afternoon of course, though there is still time for free time and fun. By late afternoon, we have some clean-up time to attempt to tame the chaos around the house. We also often have some screen time in the late afternoon — “fun” iPad game turns (no educational games required during a “fun” turn) or a Netflix/DVD show of some sort (I try and encourage at least semi-educational choices). I will often be making dinner or dealing with kitchen chaos while this is going on…or relaxing if it has been a hard day! After dinner finds us doing a variety of family activities or needed chores depending on the night. Bedtime brings one final piece of our “school day” in a sense — I almost always read aloud to Miss M for at least 30 minutes at bed time — this is when we read longer chapter books (history related or otherwise) that are beyond the boys’ interest or understanding at this point. While no two days are exactly the same in our family, this represents the way our basic routine looks as of early 2013! 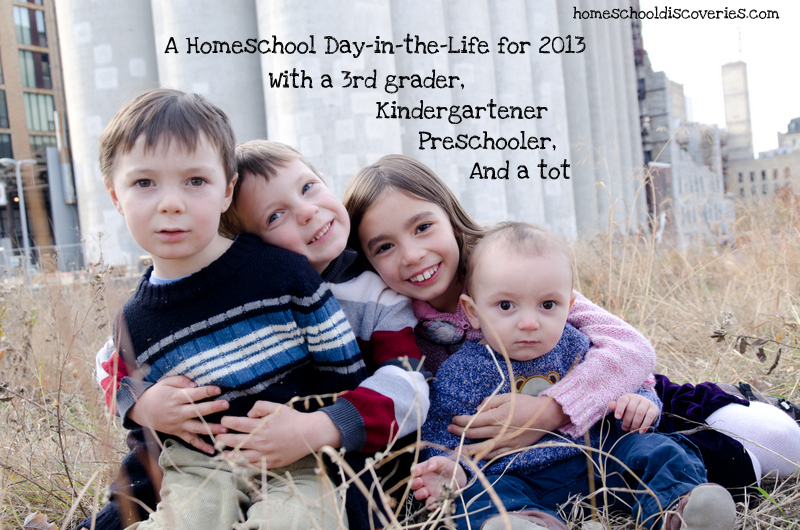 I’m joining in with the “Day in the Life” link-up at simplehomeschool.net! Two winters ago, we had plenty of snow. Miss M asked me several times if we could buy real maple syrup to make the maple sugar candy. I never quite got around to buying the maple syrup. Then last winter we had very little snow, and not much at any one time when we did get any. 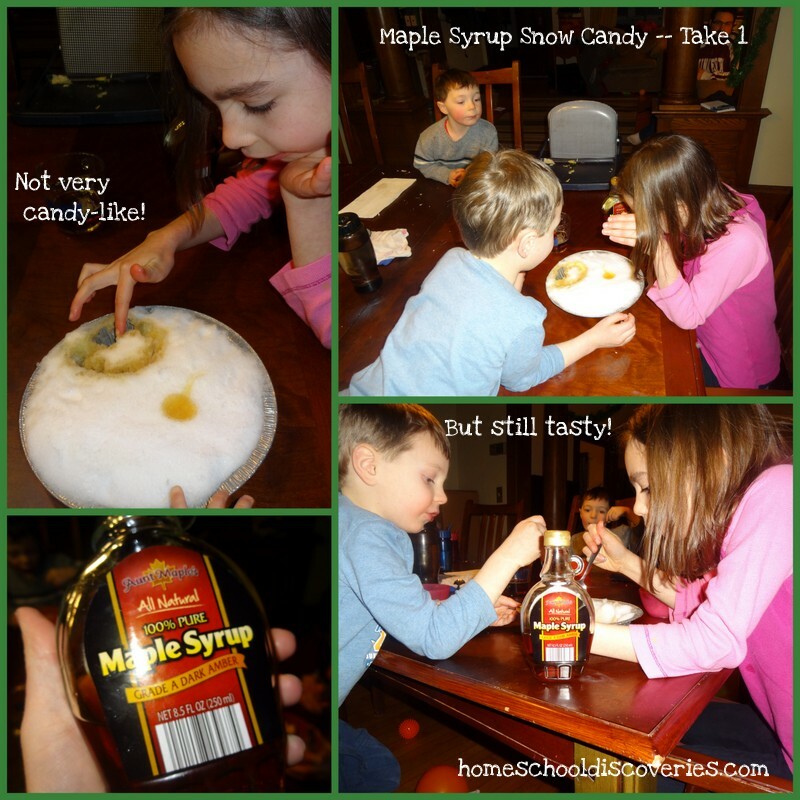 For months before this winter, the kids were asking, “Mom, is THIS the year we’ll make the maple syrup snow candy?” I resolved to finally make it happen. I found real Maple Syrup at Aldi after our first snow of the year had mostly melted (yea for bargains! ), and then we just had to wait for another significant snowfall. It’s been a dry winter, but we finally got a few inches of snow on Sunday. The result was more like…maple-flavored snow cones? Or maybe a bit like a maple “ice cream” of sorts? I didn’t want our memory of this activity to be so un-candy-like, so I thought we could try again the next day. 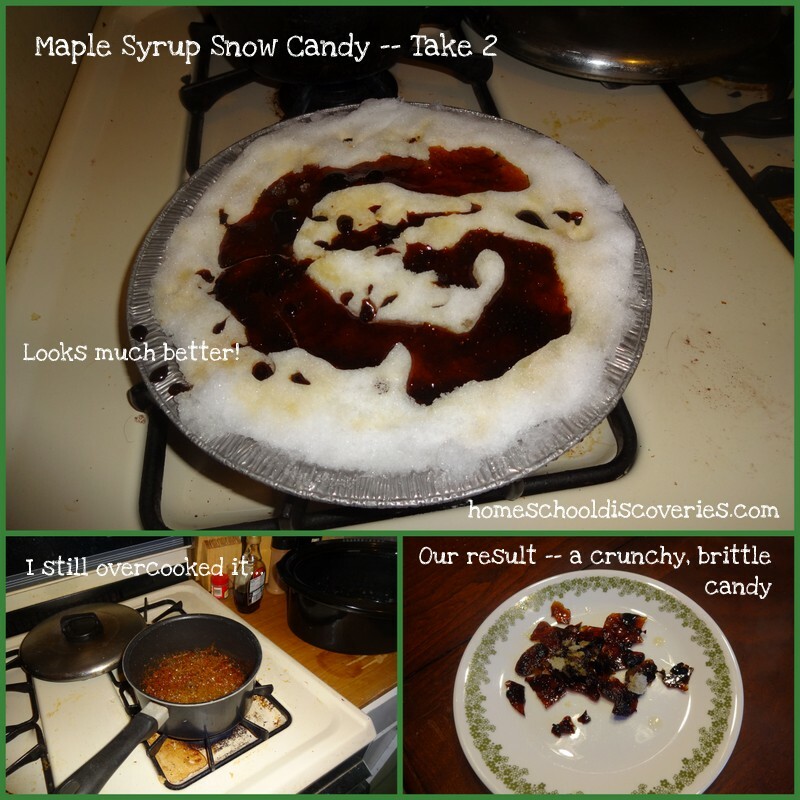 After a bit more reading, I decided maybe the recipes were right — We needed the syrup heated up to a higher temperature for the syrup to turn into candy. I don’t own a candy thermometer, so I had to rely on the cold water test to determine if my syrup was hot enough. Our result was much better, but still overcooked. I under estimated the time it would take Miss M to retrieve a pan of snow from outside. Meanwhile, my syrup got hotter and hotter — almost to the point of burning. It was probably at stage 5, the hard crack stage, instead of stage 1 the soft ball stage! But luckily, hotter produces candy of some variety! There is a lot of potentially interesting science study involving the science of sugar and candy-making. I found this unit study on candy to be very interesting! I didn’t spend a lot of time looking, but I’m sure there are many more candy science resources to be found. I may try the maple syrup candy yet again with a candy thermometer, just to say I’ve mastered this generations-old treat…or maybe we’ll move on to making the best-possible rock candy. That’s what the kids are voting for! Inventions and inventors are often a topic of interest for our family, so I was intrigued when I ran across The Year of the Horseless Carriage 1801 by Genevieve Foster. In this book Foster weaves together a narrative of early 19th century progress and invention with threads of world history that were occurring at the same time. The “horseless carriage” in this case is essentially a stem engine on wheels — more of a precursor to the locomotive than the automobile (the device more commonly referred to as a horseless carriage). Richard Trevithick is an English engineer with plenty of ideas about how to use the steam engine to make a useful vehicle. He may have been a little ahead of his time, but his ideas paved the way for more modern locomotives. At about the same time American inventor Robert Fulton wondered what would happen if he put a steam engine in a boat, and had a bit more long term success from his endeavors. While telling the stories of Trevithick, Fulton and others that collaborated with them, Foster also tells the stories of a few major socio-political events of the first two decades of the 19th century — including Napoleon, Lewis and Clark and the War of 1812. She also weaves Beethoven into her story — I hadn’t exactly realized he was contemporary to this time period. An interesting note here is that apparently Beethoven greatly admired Napoleon at one point and originally dedicated his 3rd symphony to him — but rescinded the dedication after it became apparent that Napoleon was turning into a cruel tyrant. I read this book aloud to Miss M and Mr. E. They enjoyed it enough to typically ask me for more after I read a few pages. 🙂 Some of the material in this book was repetitive for us since we were also reading A New Nation by Betsy Maestro at the same time. I skipped a few pages and paragraphs here and there to make sure the kids didn’t get too bored with the repetition. Overall, we all enjoyed Foster’s very engaging narrative style. She is really telling a story with history. Because we were reading other books about the same time period as well, I might have enjoyed a book just about the inventors and inventions written in the same style a bit more — but especially for anyone looking for just a brief introduction to this time period (1801 to 1821), this book is a good choice. At only 92 pages (which include quite a few nice black and white illustrations drawn by the author), it didn’t really take us too many sittings to read this book. I’ve checked out a few other of Foster’s books from our library, but those were a bit longer both in page length and amount of time covered — I’ll be keeping those in mind for the future when the kids are a bit older. Miss M just loves finding interesting craft and activity books from the library and working on the projects in her free time. She recently found an American Girl activity book called Tiny Treats, and was eager to make a few of the miniature goodies. The kids had a “tea party” with apple cider in tiny doll-sized cups to go with the “donuts,” while Miss M served us the “watermelon” another day as a dessert after dinner. Did you see my “Tiny Treat” in the collage? I’ll take an Espresso Con Panna and a dark chocolate kiss as a treat any day! 2. Miss M probably got the most out of the experience with the Rock and Mineral kits. She found a favorite rock from her personal collection, and wrote “My rock study” on a blank piece of paper, and and tried to identify her rock using the tests we learned about in the kits. We didn’t quite get to the bottom of her rock’s identity though. 3. I’m teaching 1st/2nd grade science at our co-op this year, and my lesson this week was on inertia (BFSU lesson C-5). 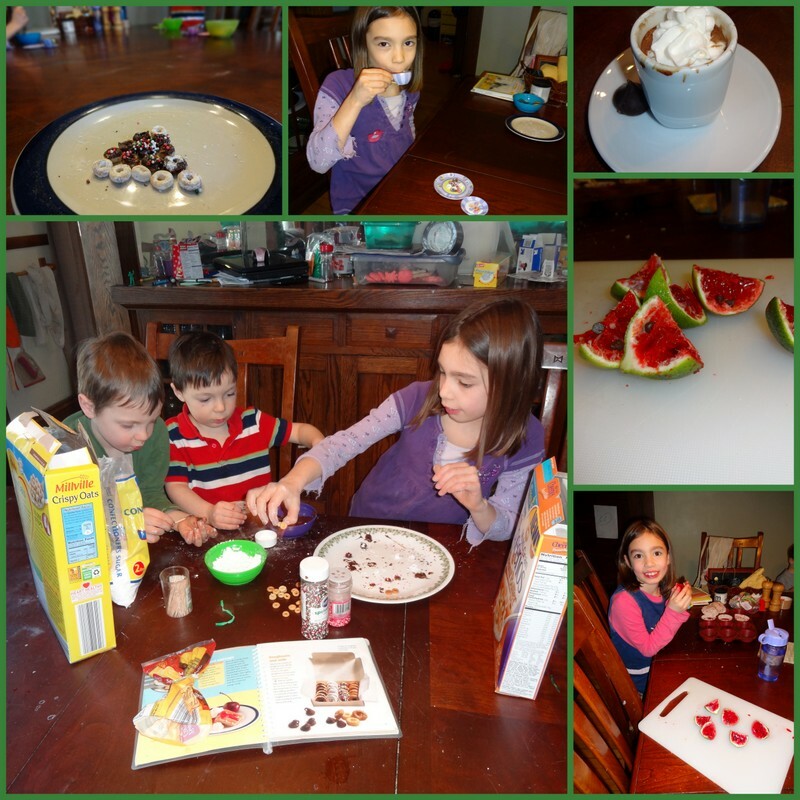 My kids enjoyed helping me practice my activities and demonstrations. 4. Mr. E continues to enjoy the challenge of two digit plus two digit addition in RightStart B. This week he did lesson 75 and most of lesson 76. We also read 4 chapters of Life of Fred Apples (The level is appropriate for Mr E, but Miss M listens in for fun). The kids would probably do the entire book in a week if I would let them! Miss M continued with lots of multiplication practice (via iPad apps, music, games, and worksheets) and finished up a section of Math Mammoth 3-B on rounding and estimation. 5-6. We started Sentence Family this week for a fun introduction to grammar and it was a HUGE hit! Sentence Family takes a fun “art and storytelling” approach to basic grammar. I intended it to be just for Miss M, but after the boys overheard a bit of the first chapter and saw the drawing Miss M made, they insisted on listening as well. After that first day, all three kids old enough to draw came to listen when it was time for this study. You’ll see in picture #6 I made some very basic notebook pages to go along with each character. I don’t think Mr. K (Pre-K) is getting much out of it — he just likes to draw. But I think Mr. E (K’er) is “getting it” just about as much as Miss M (3rd grade) is. I’m sure I’ll have more to say about this fun program in the near future. History: We started our next unit in our US History studies. We’re now up to the period of time between the War of 1812 and the Civil War — So essentially about 1815-1860. The main focus of our study will be the Pioneers and westward expansion, but we’ll hit briefly upon other major events of that period like the Trail of Tears, the Alamo, etc. We’ll save some of the major topics about slavery as a prelude to our study of the Civil War. I don’t have a spine text or key text I’m super excited about for this period, but we are trying out a bit of This Country of Ours by H.E. Marshall. This is an older work and requires an occasional bit of “editing” as I read for dated (aka somewhat racist) language, but I like how it gives an overview of American history while still being engaging in its tone. Of course we also have an overflowing book basket of books for Miss M to read independently or me to read out loud. And finally…Guitar Lessons: Miss M had her first-ever guitar lesson this afternoon. We got the two older kids a guitar for Christmas, but we’re going to wait on formal lessons for Mr. E until his hands are just a little bigger and he has a bit more patience for practicing. Miss M is very eager to learn and we found a teacher that I think will be a good fit for her, at a location that is a very reasonable drive from our house. She has been asking for music lessons for quite a while, and I am so excited for her to be starting this journey. I’m linking up with Collage Friday and The Weekly Wrap-Up! With my recent holiday blogging break, I’m a bit behind on sharing about our read alouds! We took a read-aloud break in late December and early January as well (between travel and sickness, regular reading time was hard to come by! ), but we finished three read-alouds in recent weeks that I realized all had a common theme. Our selection of books about being alone in the wilderness began with Naya Nuki: Shoshoni Girl Who Ran by Kenneth Thomasma. We enjoyed another book by Thomasma earlier this fall, and I had originally planned for this book during our initial US History unit on Native Americans. However, once I had this book in hand I realized it fit much better in the unit we just finished on America as a new nation after the Revolutionary War. Naya Nuki and several other members of her Shoshoni tribe are captured and taken prisoner by an enemy tribe. She and her fellow captives are forced to walk for days to this tribe’s village, where they become slaves. Naya Nuki’s closest friend and fellow captive is none other than Sacajawea — who of course later becomes famous as a guide to explorers Lewis and Clark. Naya Nuki sets her mind on a different path than that of Sacajawea or any of her other fellow captives. She is bound and determined to escape and return home — no matter what dangers she might face on the way. While on the outside she looks like a model servant, she secretly plans her escape and hides away supplies she will need. When the moment is right, Naya Nuki runs under cover of darkness from her captors — and thus begins a journey of many weeks to trek many hundreds of miles to the home of her people. Naya Nuki is a very brave young woman, and she is incredibly resourceful as she perseveres through the long journey across prairie and mountains to her homeland. Miss M and I both enjoyed this exciting story. I’m bummed that our library doesn’t have any of Thomasma’s books. I guess I shouldn’t complain too much since our library usually has just about everything I am looking for. 😉 But used copies are available very inexpensively on amazon of many of the books in his Amazing Indian Children series. Next Miss M and I read Sarah Witcher’s Story by Elizabeth Yates. I originally had this book planned for Miss M as an independent reading selection for history. As this book was nearing its library due date (with no option to renew — somehow our library system only has one copy and someone else wanted it too), I decided the surest way to make sure we read it before it went back was to make it our next read-aloud. This was a pretty quick read for us. Sarah Witcher is a young girl from a family in New Hampshire in the early 19th century. She’s very young — her age is never given, but I am guessing she must have been three or four. While her parents go off to visit friends and leave Sarah’s older siblings in charge, Sarah wanders away to play in the woods. Her siblings are absorbed in what they are doing, and see so little of Sarah they assume their parents must have taken Sarah with them! Sarah’s disappearance is realized at the end of the day, touching off a multi-day search in the nearby woods. Sarah, meanwhile, is surprisingly resourceful for a young girl. I don’t want to give away too much of the story, but a great deal of her survival is thanks in part to a wild animal she mistakes for (or perhaps just really wants to believe is) the family dog. As you might guess, this story has a happy ending and shows a great portrayal of her family’s unwavering faith that God cares for them. Our final read-aloud fitting in with this theme is a bit different, since it deals with an even shorter time period of being out there alone. The Bears on Hemlock Mountain by Alice Dalgliesh is an easy-reader chapter book I selected as a read-aloud for all the kids. We pretty easily finished it in one long sitting, so even a newer reader who is ready for this sort of reading could probably finish it in short order. Jonathan is asked by his mother to complete an important errand — going over Hemlock mountain to his Aunt’s house, and returning with a large pot needed for an impending family gathering. Hemlock mountain is called a mountain, but we’re told it’s really just a big hill. Jonathan fears there might be bears on Hemlock Mountain…but, no, that’s not really true, is it? After Jonathan lingers just a bit too long at his Aunt’s house, he finds out for himself the truth about the bears on Hemlock Mountain. For as “easy” of a read as this book it, it really makes a great read aloud. There is the rhythmic refrain of , “There are no bears on Hemlock Mountain. No Bears! No bears at all!…”, to the other opportunities for dramatic pauses while reading that make this book a fun one to share out loud. All three older kids (ages 8, 5, and almost 4) like this one a lot and begged for me to read “just a little more” until the whole book was finished! I’m linking up with Read-Aloud Thursday at Hope is the Word!